When it comes to flooring options, one must consider many things. As important as it is to install flooring that blends well with your style and home ambiance, comfort is just as crucial. Especially if you have little ones roaming around the house. For rooms that get a lot of activity from children, it is essential to know which kid-friendly flooring options to choose from. Consider flooring that is durable enough to withstand constant usage without damage. The following kid-friendly flooring options will be great preferences for your home. The soft and comfortable benefits of carpet make it an easy option for kid-friendly flooring. With all their playing and falling, your young ones will be safer as opposed to other hard surface flooring. As forgiving as carpet can be, make sure to regularly clean your carpets to avoid accumulated dirt and dust from forming. The cleaner the environment, the healthier your child will be. Whether you are decorating a nursery or living room, consider carpet flooring for your home. Although certain hardwood flooring can be non-scratch resistant and subject to wear and tear, there are many routes you can take to ensure a safe and complacent environment for kids. 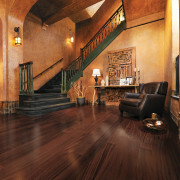 The benefits of hardwood flooring are its abilities to last long and be easy to clean. Though the surface may not be the safest kid-friendly flooring option, you can consider purchasing stylish rugs or play mats to do the job. Also, some hardwood have natural dents and scratches which makes accidental scratches less obvious. Being abundant in styles and colors, easy to clean, and durable, laminate is another possibility for kid-friendly flooring options. Laminate provides stylish luxury to your home while still granting safety and scratch-resistant benefits for areas that undergo constant movement. Laminate flooring is also very easy to install and goes well in just about any room of your home! If you’re stuck between hardwood and tile, laminate is an alternative. Laminate has a more comfortable surface than pure hardwood, is often times more affordable, and most importantly, is safer for young children to play on. Consider laminate and have some fun choosing your design. At Go Mobile Flooring, we have many selections you and your family can choose from. We also bring our mobile showroom to neighborhoods in the Tampa Area. Visit our website and explore your options today. Contact us and get started on preparing your kid-friendly flooring space.